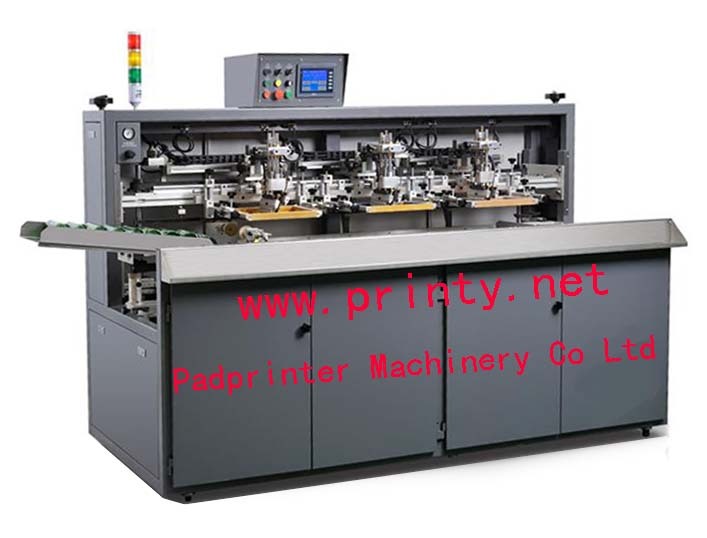 Professionally Manufacture Wholesale and Supply Glass bottle screen printer,Glass bottle screen printing machine,Wine Beer drinking bottle screen printer,Automatic 3 color glass bottle screen printing equipment. The Glass bottle screen printer,Glass bottle screen printing machine,Wine Beer drinking bottle screen printer,Automatic 3 color glass bottle screen printing equipment is specially designed for screen printing on all kinds of glass containers, such as wine bottles, beer bottles, drinking bottles and glass cups etc. It uses the most simple technique to solve the problem of multi color printing on glass bottles that have no registration points. Another important technique is to print with hot melted high temperature glass ink, then burn in a high temperature oven so that the ink merges with the glass. The printed image is firm and bottle can be washed repeatedly, this is the best way to prevent the environmental pollution and save costs. It is widely used both domestic and abroad. The project requires very small investment and return is fast. Our professional techniques and after sales service will make your investment and project successful!